Do you suffer from poor circulation? If so, CircuLegs by Solaray is the product for you. The special horse chestnut formula developed by Solaray strengthens blood vessels and increases circulation, specifically in the legs. Horse Chestnut contains a chemical substance known as aescin, which in clinical studies has been reported to promote the blood circulation. Aescin has been found to promote blood circulation through the veins by increasing the tone in the walls of the veins, whereby enabling blood to flow more freely. Horse chestnut is a remedy for leg vein health. It tones & protects blood vessels and may be helpful in ankle edema related to poor venous return. Utilized extensively throughout the world as an anti-inflammatory agent for a variety of conditions, it is also being used for vascular problems. The plant is taken in small doses internally for the treatment of a wide range of venous diseases, including hardening of the arteries, varicose veins, phlebitis, leg ulcers, hemorrhoids and frostbite. Great for hemorrhoids, varicose veins, circulation, and vascularity. Butcher's Broom is a member of the lily family that grows in the Mediterranean. Butcher’s broom is an evergreen like shrub with a long history of use in Europe for promoting circulatory system health. Among other benefits, butcher’s broom helps tighten blood vessels and capillaries, which has generated interest for use against varicose veins. It’s also been shown to relieve fluid retention and other symptoms of chronic venous insufficiency. Varicose veins and hemorrhoids are common and associated with a loss of blood vessel integrity, & Butcher’s broom is improves both conditions by promoting healthy microcirculation, capillary flow, and strengthening connective tissue. Bioflavonoids strengthen the blood vessels & improve circulation. they can be very helpful If you bruise easily, have Hemorrhoids, varicose veins, or poor circulation. Bioflavonoids have the ability to neutralize reactive oxygen species by donating one of their electrons, thus stabilizing the molecule and breaking the oxidative chain, and this can result in visible signs of healthy, more vibrant skin. 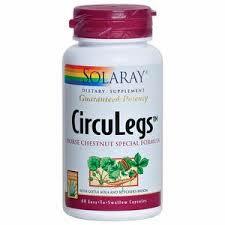 With this powerful combination of fast working ingredients, you can really get your circulation back on track with CircuLegs by Solaray. Other Ingredients: Gelatin (capsule), Cellulose, Maltodextrin, Magnesium Stearate and Silica. Recommended Use: Take two capsules daily with a meal or glass of water.